With his first feature film, Grace, director Paul Solet chases after that most elusive of emotions: dread. Not content to sucker-punch his audience with the thin stereotypes and jump-from-your-seat spooks that have become genre boilerplate, he opts to patiently cultivate a set of characters whose mores and manias are intimately, yet disturbingly, familiar, before plunging them into a nightmarish bloodbath. The investment pays off. Solet's picture is at once a rollicking bourgeois farce in the tradition of Buñuel and a Polanski-inspired work of terror behind closed doors, a loogie hocked in the bright eye of American optimism. The film opens to the kind of parlous dinner-table bickering that has come to define family psycho-drama. On the one side we find our charming young couple, the socially conscious, vaguely New-Agey Madeline and her somewhat more cautious husband, Michael. Yuppy political correctness made flesh, it's not long before they're going at it with the tighty-whitie atavism incarnated across the table by Michael's parents, Vivian and Henry. The sparring, set off by the seitan-based gruel that Madeline whipped up for dinner, quickly degenerates into a no holds barred brawl over pregnant Madeline's decision to deliver her baby through a midwife. As Madeline and Vivian tumble into a vicious spiral of distrust, the men are sidelined, left as helpless, effete bystanders -- and that's just the start of their problems. When Michael is suddenly offed in a gruesome car accident, Madeline is left to fend for herself against the manipulative wiles of her step-mother. Feeling robbed of her son, the family's matron will go to any length to get her hands on her newborn granddaugher, Grace. But this is no normal baby girl. As evidenced by a traumatic breast-feeding session, little Grace is hungry for something other than milk. And she's no vegan. Genre veteran Jordan Ladd hits all the right notes in her performance as Madeline, especially when it comes time to slam them discordantly. Her transformation from a practiced, subtle warrior of domestic politics to an anemic, quivering mass reminiscent of Bruno Ganz's turn as Hitler is an awesome spectacle. Throughout it all, her ferocious maternal instinct is gripping, hilarious, and poignant -- usually all at once. At one moment, she's off to the super-market to buy organic meat, advertised by the slogan "kinder kills, cleaner cuts." The next, she's gripping a pick axe, fending off an unwanted intruder. "She's special!" she bawls in defense of her baby's unusual diet, "She needs special food!" We're plunged further into the insanity by a fundamentally combative editing style that lures us in with with a fondness for graceful, slow-moving dramatic sequences and then knocks us off our feet with quick jabs and pummeling montages. Solet has a knack for visual antics, in one case cutting from a blood-soaked cow slaughtering to the guzzling of a glass soy milk. The array of gags and winks, largely centered around the consumption of meat, acts as a pressure-release valve for his film's basic seriousness. That said, the director is no preacher, and Grace is not a polemic; by its end, the thread of social commentary that runs through the film gets lost amid the fray. While the moral subtext is largely meant as satire, it's a joke that doesn't have an ultimate punchline. But amusement is not the point. Fear is. And what makes Grace so terrifying is exactly what sets it apart from conventional fare; Solet has stood the classic formula on its head. Instead of a confrontation between mankind and some terrifying monster from beyond, Solet's monster is motherhood itself. By taking aim at a woman's natural urge to protect her child no matter the cost, Solet pulls off a deliciously cruel coup: he shows us what it means to be human. And that is exactly what horror is supposed to do. Thanks for the review. Can't wait to see this one. I liked the short film that this film was "born" from (yuk yuk) though I must say I am surprised I haven't heard any IT LIVES comparisons. I am looking very forward to seeing GRACE. Nice review. 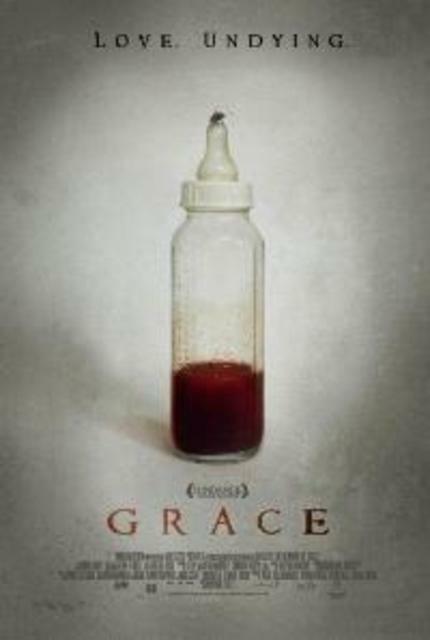 All those years ago as a teen as I was preparing to watch ROSEMARY'S BABY, I think I was expecting this here, more than what I got with that film, so I am most certainly looking forward to GRACE. I think they're definetely different beasts, though thematically they come to similar conclusions about motherhood. I actually thought this film had more in common with Repulsion, especially the second half. Your review is a lot more positive than mine yet I find myself agreeing with most of it. Even though I hated "Grace" with a vengeance, I cannot deny the craftsmanship on display. And I fully concur with your "Repulsion" remark.